Built on a splendid beach overlooking the North Bay of Halkis on the island of Evia, Paliria Hotel commands a magnificent view of the famous Evripos Straits. Conveniently located within walking distance from Halkis city-centre, merely 70km from capital Athens, 100 m from the beach, 90 km from the airport and 22 km from the port. 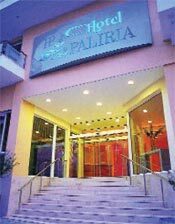 For hundred of years Paliria Hotel is in the services of the visitors of the town which is loyal to the rules of greek hospitality. Built in 1904, It has hosted great personalities such as: politicians, artists and businessmen. In 1974, It has changed it's appearance and became a seven-floored building with 98 rooms which was going together with the rapid tourist evolution of the area. This fully renovated establishment provides an ideal venue for business travellers and holidaymakers alike. Its privileged location makes the hotel the perfect base for visiting all the surrounding sites and some of the Aegean islands. The seven-storey main hotel building houses 93 luxuriously furnished, spacious guestrooms (2 rooms for the disabled 8 single rooms, 6 triple rooms, and 77 double rooms) and five exquisite suites, all appointed with air condition, private bath, direct-dial phone, radio, TV, Video, Internet Access, Ventilation, Security card access, Mini Bar, Room service, safe and a balcony affording fascinating sea-views over the Evripos Straits. The visitors can enjoy a drink, beverage or light meals in the hotel's snack-bar, which can be also used as a restaurant for groups or receptions upon request. On premises you can find a snack bar with terrace serving light meals and drinks. The main bar and several large and small cocktail lounges provide a cosy ambience for relaxing over cocktails. Other facilities include a luxurious coffee house, an elegantly decorated ballroom, a playroom, demonstration arcades and a promenade coffee house. 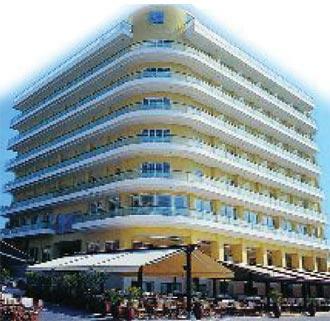 The hotel is ideal for vacationers as well as businessmen. For guests who wish to combine business with pleasure, the hotel boasts a fully staffed business centre providing a full range of business and secretarial services. Suitable equally for large or small events from 20 to 250 participants, the four conference halls feature latest technology sound and video systems including microphone and sound installation, slide projector, overhead projector, TV and screens, as well as video projector for video and P.C.